Last week I got an insanity deal at nomorerack. 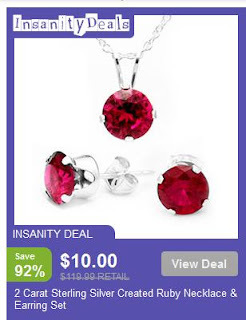 Imagine a 2 carat of sterling silver ruby necklace & earring set was only $10 but the original price was $119.99 plus flat rate $2 shipping. Who in the world sell that kind of price a 92% discount. They have a deal everyday so you will save bucks when you are a member of nomorerack. If you are new to that site and sign up you will receive $10 as a new customer so click the image above to sign up and receive a daily deals. wished there is something like that here in the Phil. Great find!